James K. Polk Presidential $1 Coins and dollar rolls are now available following their ceremonial launch Thursday by the US Mint at Polk’s ancestral home in Columbia, Tenn.
"The James K. Polk Presidential $1 Coin is the 11th in the United States Mint’s Presidential $1 Coin Program," United States Mint Deputy Director Andy Brunhart told the crowd. "It is my great privilege to present the coin to the Nation." Polk is probably best known for his support and actions relating to Manifest Destiny, which was the belief that the US had the right to expand throughout North America. In following this belief, Polk annexed the area now known as Oregon and Washington from Great Britain. He also waged war with Mexico and won California and New Mexico through the Treaty of Guadalupe Hidalgo. A tireless worker, President Polk is frequently ranked high by scholars for his ability to achieve his goals. This ambition came with a price, however. Committed to only serving one term (which he did), Polk left office a much frailer man than when he entered. So much so, in fact, that he died less than four months after leaving office. The coins celebrating the eleventh President feature a striking image Polk on the obverse surrounded by the inscriptions ‘JAMES K POLK,’ ‘IN GOD WE TRUST,’ ’11TH PRESIDENT’ and ‘1845-1849.’ It was designed by the Mint’s Artistic Infusion Program Master Designer Susan Gamble and sculpted by Charles Vickers. The reverse, designed by Don Everhart, contains an image of the Statue of Liberty. This same image appears on all of the Presidential Dollars. The inscriptions ‘UNITED STATES OF AMERICA’ and ‘$1’ are also shown. Each coin is struck from an alloy of 77% copper, 12% zinc, 7% manganese and 4% nickel. The 26.5mm coins weigh 8.1 grams and have the following edge-lettering on each coin: ‘E Pluribus Unum,’ ‘In God We Trust,’ ‘2009’ and the mint mark. 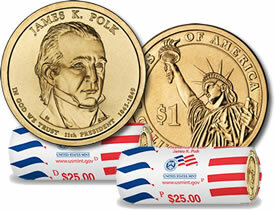 Specially wrapped rolls containing circulation quality strikes of the coins will be available for $35.95 each, plus the standard Mint shipping and handling charge of $4.95 per order. Each roll contains 25 coins, either from the Mint in Philadelphia or the Mint in Denver (buyers choice). The wrapping shows the mint of origin, the face value of the contents ($25) and the United States Mint Logo. Or by calling their toll-free number 1-800-USA-MINT (872-6468). Collectors may also subscribe to the Mint’s Online Subscription Program, and automatically receive future Presidential Dollar rolls as they become available. Presidential $1 coin were authorized by Congress in the Presidential $1 Coin Act of 2005 to honor the former Presidents of the United States. Created by Congress in 1792, the United States Mint is the Nation’s sole manufacturer of legal tender coinage. Its primary mission is to produce an adequate volume of circulating coinage for the Nation to conduct its trade and commerce. The United States Mint also produces proof, uncirculated and commemorative coins; Congressional Gold Medals; and silver, gold and platinum bullion coins. I have a james k polk coin. Not sure, but it is not the presidential $1 coin I keep seeing listed. Any1 have info on what this is & its worth…? I have a Polk Dollar but it does not have a mint date on it. I am looking for the value of this coin. It has 5G on the presidents collar. If it’s the standard circulating version, it’s worth one dollar. The 2009 date is on the coin’s edge. The initials “SG” on the collar are for the coin’s reverse designer, Susan Gamble.